PokerStars recently recruited Tennis legend Rafa Nadal following the pro’s announcement that he wanted to improve his poker game. His debut ad appearance for PokerStars sees Rafa walking through the streets of Barcelona, fully engrossed in a game of poker running on his smartphone as – unbeknownst to him – increasing numbers of fans gather round him taking a keen interest in his poker progress. The advert was filmed in Barcelona earlier this year, and involved a hefty 80-strong crew plus 50 extras. Nadal has become part of a growing team of great athletes to partner up with PokerStars, joining Sebastien Chabal, Gianluigi Buffon Boris Becker, and Mats Sundin. 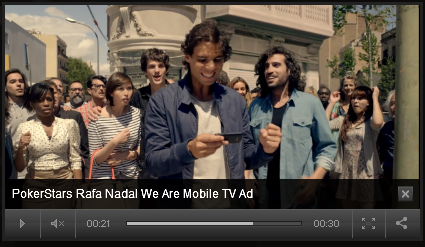 You can see the new PokerStars Mobile App advert starring Rafa Nadal here.